X-files and 30 Days of Night. When I first heard of this crossover it made me think, ‘why not?’ Why hadn’t this been done before? Well, I guess it was a matter of timing. X-files ended its run in May 2002 and the first 30 Days of Night mini-series came out later that year. X-files had lost a lot of steams towards the end so I guess doing a crossover with it at the time didn’t make much sense. 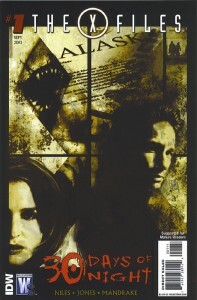 But with the 2008 movie “X-files: I Want to Believe” and the comic series Wildstorm published that same year, X-files has had some exposure once again.